Ekaterina Walter wants you to "Think Like Zuck." 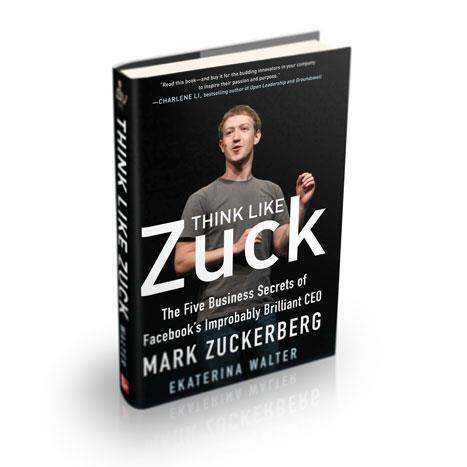 She has written a book of the same name, subtitled, "The Five Business Secrets of Facebook’s Improbably Brilliant CEO Mark Zuckerberg." I was provided a free copy of the book so that I could furnish you with a review. "Think Like Zuck" is easy to recommend, popping with inside information about how Facebook became the force it is today, but the book benefits by considering more than just Facebook and its founder, Mark Zuckerberg (or Zuck, as he likes to be called). Included in the book are interesting insights and tales from companies as diverse as Zappos, XPLANE, TOMS Shoes, Southwest, Apple, Dyson, 3M and JESS3. This makes the book much more approachable by bringing the lessons of good leadership out of the world of dorm room startups and into the realm of retailers, airlines and manufacturers. Walter's "Five Ps" that form the structure of "Think Like Zuck" are not that surprising. No one, I imagine, will see the list and think, "I never would have thought that was important!" Those Five Ps are Passion, Purpose, People, Product and Partnerships. The magic in the book is not that Walter has hit upon a secret recipe but that she so thoroughly explores why each of these are important to the success enjoyed by Facebook and other industry leaders. This isn't to say that I completely agree with the five criteria Walter shares. For example, she goes into great detail about why passion is important, but I was left feeling this chapter would be better labeled with a different "P": Perseverance. In fact, Walter herself sounds a little unsure when she says, "What I noticed is this: the most successful entrepreneurs always have one trait in common: they never give up." One can have passion without perseverance--we all know people who have been wildly passionate about a hobby or issue one day while ignoring it the next--but it is difficult to have perseverance without passion. I would have liked to see "Think Like Zuck" spend more time on how great leaders have the ability to be patient and strive for long-term success rather than chasing after quarterly stock maximization. The book touches on this without diving deep. For instance, Zuck felt it was vital he retain majority ownership of Facebook even after its IPO, noting, "Companies are set up so that people judge each other on failure. I am not going to get fired if we have a bad year. Or a bad five years. I don’t have to worry about making things look good if they’re not. I can actually set up the company to create value.” This commitment to long-term success is also seen in another quote from Zuck, “The companies that succeed and have the best impact and are able to outcompete everyone else are the ones that have the longest time horizon.” The ability to put the long-term above immediate gratification of oneself or the market is an important attribute that deserves more than Walter gives the topic. The Purpose chapter tells how Zuck passed on opportunities to become fabulously wealthy at an even younger age. He turned down a $1 billion offer because "for him, the journey wasn’t complete yet; he knew he could take Facebook much further by not selling it, by staying the course and sticking to his purpose. He knew there was much more opportunity ahead to make an impact, to change the world." The People chapter was another that struck me as mislabeled. It's a great chapter full of terrific ideas, but "Think Like Zuck" seems to be saying that what is vital is not people but leaders who create and commit to culture. Walter gives a nod to this when she quotes from the book "Good to Great," noting that "The old adage ‘People are your most important asset’ turns out to be wrong. People are not your most important asset. The right people are." In addition, she ends this section of the book by noting "I cannot wrap up this chapter without talking about leadership." Maybe she didn't want to ruin the alliteration, but I thought Walter made a much stronger case for how Culture was important rather than that People are. The Product chapter felt the weakest to me. In part, that is because Walter ends up relying so heavily on the Passion/Perseverance attribute from earlier in the book. She notes, for example, that "Zuck understands that to be successful, one needs to run a marathon, not a sprint." She quotes Thomas Edison, who said, "I failed my way to success." And she shares that James Dyson wasn't successful in developing his bagless vacuum cleaner until his 5,127th attempt. If I was a bit disappointed in the Product chapter, I was thrilled with Walter's exploration of the value of Partnerships. This is not a chapter on the importance of crowdsourcing or development partners; instead, "Think Like Zuck" explores how great companies are often led by two types of leaders who bring different skillsets: The Visionary and The Builder. The case is made quite convincingly as Walter examines leader partners such as Mark Zuckerberg and Sheryl Sandberg, Walt Disney and Roy Disney, Bill Hewlett and David Packard and others. I may quibble with whether Walter selected the appropriate chapter labels or too quickly moved away from one or another important topic, but it should be clear from this review that "Think Like Zuck" got me thinking. The book is engaging, full of interesting stories and is an inspiring read. I hope you will consider purchasing a copy and considering how you can bring more Zuck-like thinking to your corner of the world. Ironically (or not), the most inspirational words in this book do not come from Zuckerberg, Edison or Hseih; they come, instead, from Ekaterina's father: “Don’t try to change the world. Find your purpose, live out your potential to the fullest, serve others kindly, and the world will change around you.” His daughter learned well. Based on your review, I get the sense she skated over the top of some issues. In my opinion, leadership is a critical factor in the success of any of people mentioned, but it seems to be an afterthought in the People section. Thank you for pulling out the quote from Good to Great about having the right people. It is one issue I get on my soap box about regularly. Overall, it sounds like a fun read, and I intend to check it out. The entire book is about leadership, really, so I don't think she skimmed over the importance of leadership. But, I will say that some really key factors in what makes Zuck Zuck (and helped other companies) are not explored as deeply as I'd wish. But, as you point out, this doesn't prevent the book from being a very good and worthwhile read! Augie, not looking to start a feud or anything but I'd be interested in your thoughts on Paul Gillin's Attack of the Customers, given what I believe is your belief that "Social Media crises" are essentially tempests in a teacup (if this is too gross a generalization). Ken, I have not read the book, but if I find time, I will. I have, however, seen a thousand blog posts and conference presentations about "social media crises." While there have been a few that have brought real harm to the organization--Netflix comes to mind--most have been things that resulted more in creating headlines than creating actual business problems. We all live in a fishbowl, and every time an insurance company or air carrier get hammered with another "viral" issue, a thousand self-appointed experts launch blog posts to predict real harm to the bottom line. None go back six or twelve months later to look for real impact on the financial. If a company loses even a modest number of customers or it fails to create new ones, that should be evident, and if it is not evident, then the company simply did not suffer short-term impact as all those blog posts predicted. Of course, over time this stuff matters a lot. I firmly believe reputation matters! But in the marketing, PR and social industries we act as if every viral event brings a company to the bitter edge of disaster--time has shown us this is simply not the case. Much like marketing in general, the time has come for us to focus not on managing the short-term "crises" but building long-term value, and this happens not with social or marketing strategies but with changes to company mission, culture and leadership. By the way, since I used Netflix as an example of a company that suffered real harm, let's look at that harm. In July 2011, Netflix badly bungled a change of business model, faced a customer revolt via social media and had to back peddle. The stock took a hammering--it had peaked at around $300 in 7/2011 and was down under $75 four months later. And there is evidence both the top and bottom lines were adversely affected--in the five quarters before 7/2011, Netflix grew the top line by 10% a quarter; in the five quarters including and since 7/2011, they've grown only 2.8% per quarter. In terms of Net Income, the five quarters before their disaster saw four quarters of income growth; in the five quarters since, income was down in three of those quarters. In fact, Q3 2012 net income was down almost 90% compared to the quarter before the crisis. If more company results demonstrated this sort of impact from customer revolts, I'd certainly be a believer, but if you look at NBC's Olympics snafus, Bank of America's debit fees revolt, Progressive's legal issues that became a social media cause and even United Breaks Guitars, it's hard to see where any of these events adversely impacted the organization in financial ways. If you know of others that demonstrably impacted business, I'd certainly love to learn of them! But, I contend company reputation matters in the long-term, but these short-term "crises" are, as you put, tempests in a teacup. I agree with you as a rule, but focusing on the bottom line is not taking into account the full impact of a crisis. Very often companies learn from these crises, change their procedures and become better for it. That's the good news. Dell is certainly a prominent example of that. United Airlines claims to use United Breaks Guitars as a case study for customer service employees and says it has changed some practices based on the lessons of that incident. I suspect the baggage handlers are operating under stricter rules now. There are cases in which the damages the more long-term. The Susan G. Komen for the Cure Foundation was the victim of a massive customer attack last year over its decision to cut off funding for Planned Parenthood. Six months later, attendance at its Global Race for the Cure event drew about one third fewer participants than the previous year in Washington, Seattle, Tucson and Winston-Salem. That certainly had an impact on Komen's fund-raising success. The beef industry was the target of a customer attack last year over "pink slime." The incident triggered large-scale layoffs at Beef Products Inc., which is the country's largest producer of lean finely textured beef and bankrupted AFA Foods, another large producer. This all happened in less than a month.